Dedicated GPS unit that contains all the maps for full Israel Navigation. Your choice of USA or W. Europe maps as added bonus.Includes July 2010 updates. Buy now & make your visit in Israel complete. 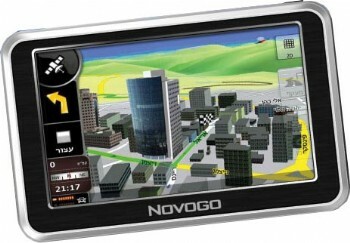 Novogo I905 is based on a 4.3” widescreen. The new screen size makes this new device easier to use than ever and provides a widescreen view of the world. Larger icons and a brighter display with a user-friendly touch screen make it easier to set your destination. 1, 2, Go! Maps of Israel are pre-loaded and ready to use out of the box.